(LWI) – The first Nordic translation of The Lutheran World Federation (LWF) Gender Justice Policy (GJP) will help make it part of the life of the Evangelical Lutheran Church of Finland (ELCF), Helsinki Bishop Irja Askola predicts. 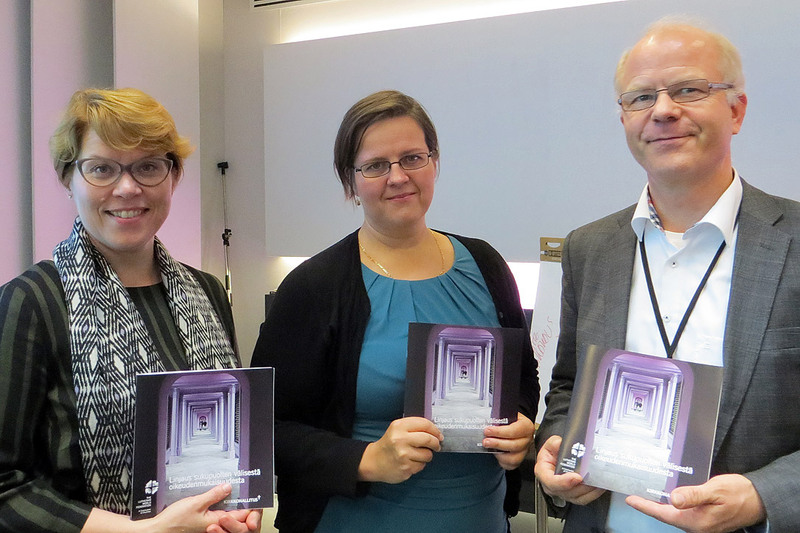 The Finnish translation of the global document, which was launched at a seminar attended by 60 participants in Helsinki on 24 September, underscores the inclusive principles of the LWF policy adopted in 2013, she added. “Growing towards an inclusive community, one needs to communicate with the language that is known by the members of that community. Not everyone in Finland understands English! Sometimes the global document, which you read in your own mother tongue, invites you differently,” she noted. “Well, this speaks to us and about us,” she emphasized. The GJP outlines the main steps towards reaching gender equality and justice. A number of churches in the worldwide LWF communion have already begun to use it as a tool in their respective contexts. Other completed translations in addition to LWF’s English, German, French and Spanish include Japanese, Korean and Swahili. Askola noted that many of the principles embodied in the LWF policy are already known to the ELCF. However, she added that having it in Finnish will raise new questions around inclusiveness. “Do we invite into our processes only those whom we know as ‘safe causes’ or do we take a risk? In other words, is there a possibility of learning from those who we do not know yet or whose questions might disturb us? Do we dare to ask?” she concluded. The ELCF has over 4.1 million members in its 430 parishes. Askola, the country’s first Lutheran woman bishop, is among the nine diocesan heads of the church that is led by Archbishop Dr Kari Mäkinen.